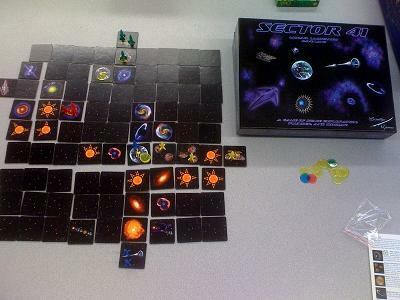 Another game that crossed my gaming table recently was Sector 41 . In Sector 41, each of the players takes on the role of an alien race that is trying to loot the galaxy. The point of the game is to collect more Glynium points (resource points) than all of the other players. Unfortunately, at the start of the game, none of the sector has been explored. Therefore, the players on each turn will get to take an action with their mothership, then move an explorer, and finally will have to move the guardian (this is essentially a mechanic to make the game go faster as it will explore for you at the beginning and then start removing tiles from play towards the end). The game ends when one player has enough Glynium points that none of the other players can catch up - then that player is the winner. Sector 41 was not a wonderful game, but did still have a few highlights. The first positive aspect of the game was a concept that it introduced called "folding space". As one of the actions that a mothership could take, you could "fold space". The game was a 9x9 grid of tiles, and what this action consisted of was taking the tile on the far end of the grid from where the mothership was and moving it to directly in front of the mothership (and shifting the other 8 tiles one farther away from the mothership). This along with a few of the tiles' special abilities allowed the players to manipulate the sector, which was interesting and worked fairly well. The second positive aspect of the game was that much of the art was high quality. A lot of the images used in Sector 41 were taken from NASA, and so they were not only high resolution, but they were also actual images from outer space. A final positive aspect (and most of the strategy of the game) came in determining the best path to get to the Glynium and to tow it back home. Different tiles allow you to continue moving, such as solar winds, space rifts, etc, and so each player would have to try to discover the fastest way to get to the Glynium before it was all harvested. The next negative aspect was the combat system. Essentially, combat was non-existant - whoever showed up last won. If you have an explorer on a tile and your opponent moves his explorer onto that tile, then your explorer is immediately moved back to your mothership - and if you were in an asteroid belt, then your explorer is destroyed. There is no form of defense, and so nothing you can do to try to protect your ship. Finally, from a negative perspective, Sector 41 was just overall clunky and not fun. The combat system was an example of how it was clunky, but I also had complaints with how several other things worked and questions that the rules didn't very clearly answer. The production quality was low - my copy came in a warped box, had to have a rules update taped to the front, and had all 4 copies of the rules/player reference sheets stuck to each other (I was able to peel them apart with minimal damage) and even the tiles were stuck together. Oh, and again, it was not especially fun, which made it all not worth playing again. Overall, I give Sector 41 a 5.5/10. As I stated before, I was very tempted to quit this game after the first two rounds, but I am honestly glad that I did not. After finishing a play-through, I see how it could have appeal to some people, but I do not think that it will have a very broad appeal. If you wind up playing this with someone, I recommend playing it out, as it seemed to get better as we went, but that is not the same as me saying that I recommend you play it in the first place.